Sanibel is one of the unique barrier islands in Florida and due to it's unique east-west orientation the island has great sandy beaches and an abundance of shells. 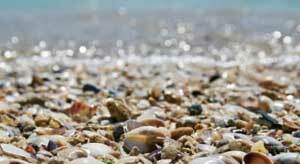 Every March, local residents and tourists gather to compare and appreciate shell collections and shell art at the annual Sanibel Shell Fair & Show. The best time to look for shells is at low tide when the seashells are more exposed. Other factors that increase the odds of finding keepsake shells, like the elusive Junonia, are at low spring tides (at full and new moons) and after Gulf storms. Check out our shelling guide to identify some of the most commonly found shells. Beach rules on Sanibel Island stipulate that pets must be leashed, and must be cleaned uap after. Alcoholic beverages are prohibited November through May. No open fires and collecting of live shells is strictly forbidden. Basic restrooms are located at all public beach accesses. Some have picnic tables and showers, all have free handicap parking. Parking at Sanibel Island public beaches costs $2.00 an hour. 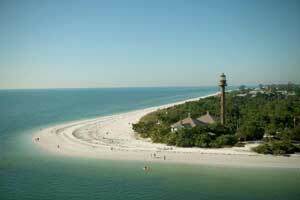 Lighthouse Beach & Fishing Pier is Located on the eastern tip of Sanibel, wrapping around to the bay side. This is where the t-dock-fishing pier is and a boardwalk nature trail winding through native wetlands. Bowman's Beach is clean and quiet, without any hotels. Visitors can park and walk over a bridge to secluded white beach. There is an outdoor shower and this is the only beach with barbecue grills. Tarpon Bay Beach has easy parking for recreational and over sized vehicles, and a short hike from the parking lot to the beach. Gulfside City Park is quiet and secluded and visitors there can use the picnic tables. The Causeway Beaches are great for recreation: swimming, fishing, windsurfing and picnicking. Vehicles can park right up to the waters edge. There is no parking fee when you park on the causeway beach. Located along both sides of the road. Restrooms are also available.